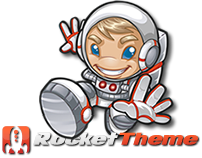 Joomla Themes - Ximenia from RocketTheme for July but will we see table cloth next month? Ximenia from RocketTheme for July but will we see table cloth next month? I sometimes wonder if the guys at RocketTheme are sitting around late in the month either getting stoned or tripping on acid when thinking what they are going to call their latest release. Whatever happened to 'business theme' or 'shopping theme' - why the need to Wiki every new theme name? But it does make it interesting, in a weird way and it works for them, but wouldn't it be interesting if you could pick the name of the theme next month in a competition? I think I'd pick 'table cloth' and see what they could come up with that. But this month, we have a theme called Ximenia and it has a lot of things to play with, albeit nothing new, but RocketTheme can be forgiven for not bringing us something new every month and it is also a good indicator that something new is coming soon.